A group of University of Texas students is preparing for the hot, the cold, the wet and whatever other natural elements they will encounter on their upcoming bike ride from Austin to Anchorage, Alaska. The 85-member group, known as Texas 4000, will be making the 4,500-mile ride beginning May 31 as part of its annual effort to raise cancer awareness and money for cancer research. Two of the group’s members, Courtney Schutze and Amy Wong, are from Flower Mound. They will be riding the “Rockies” route, which will take them through Oklahoma, Kansas, Colorado, Wyoming, Montana and into Canada. Other riders will take the “Sierra” route and the “Ozarks” route. Once they all meet in Canada, they will ride the rest of the way together into Alaska. The “Rockies” route will bring them to Flower Mound on June 4. It’s one of many stops they plan to make during their journey that will last 72 days. But they said the cause is worth the journey. Schutze is riding in memory of her father, Tom Schutze, who died from Multiple Myeloma on June 10, 2013. When she signed up for the ride, her father was battling the disease. And he promised to reciprocate. On Schutze’s blog, she recalls one of her last conversations with her dad. Wong, a 2010 FMHS graduate, is riding for her uncles – Doug died of prostate cancer in 1998, and Richard died of liver cancer in 2005. “It’s a sobering thing, but it’s why I ride,” Wong said. While someone with cancer has touched each of the riders, one of Texas 4000’s goals is to touch others along the way with hope, knowledge and charity. With each stop, the riders will meet with groups to discuss the organization and its mission, provide information about cancer prevention and survivorship and ask others if they would like to dedicate the ride to anyone. Wong said she enjoys providing information about cancer because she said it helps make a difference. The group also wants to raise money for cancer research during their ride, which is on top of the $4,500 each rider is required to raise to participate in the event. They have raised money in a variety of ways, such as participating in fundraiser rides, sending out campaign letters, hosting bake sales and fashion shows and simply making use of social media. They even panhandled on the streets of Austin. Fundraising has been a big piece of Texas 4000’s mission. Schutze said in the organization’s 10 years, it has given $4 million to MD Anderson and UT’s Biomedical Engineering Program. But fundraising is only part of the 15-month preparation, which began by going through an application and interview process to even be considered out of 300 students. Riding 100 miles a day this summer, a lot of training is required, too. 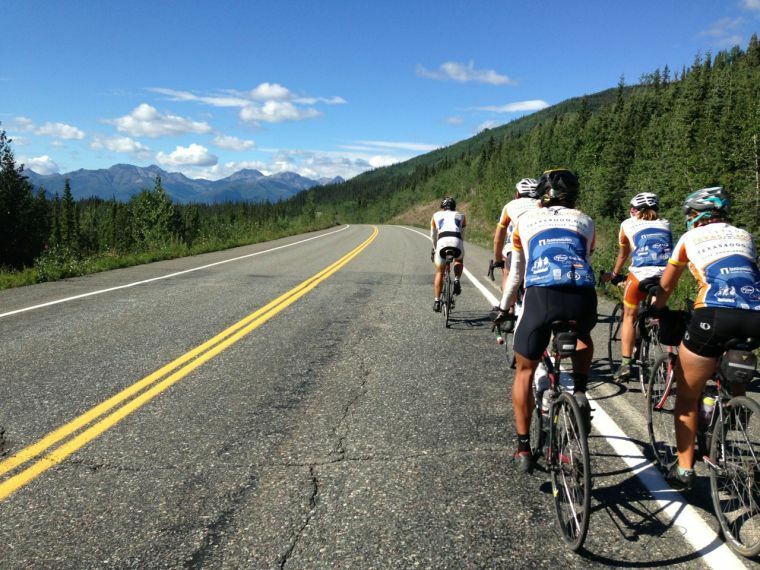 The participants began by riding at least 20 miles a day before stretching that to 60 miles a day. They were recently tested to see if they could ride 50 miles under five hours. In April, they’ll be tested to ride 100 miles under 10 hours. In all, riders will have accumulated 1,500 training miles. They will also take a safety course that will include, of all things, bear training. Wong said the route would be beautiful, yet challenging. Schutze said riders would see every weather condition, adding that her friends taking the “Sierra” route can look forward to two weeks in the desert. There will be some help along the way, though. In addition to a sidecar that will follow the team on its journey to carry supplies and provide “rest days” for each rider, the team is finding places to stay each night, such as churches, gyms and people’s homes. There will be some nights, however, where the team simply camps outside. But Wong and Schutze said they are ready for the challenge ahead, even if that means doing something they’ve never done before.